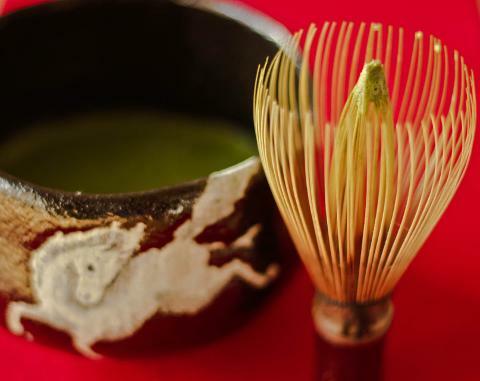 watch a tea ceremony expert practice their craft, and then try it yourself! Camellia we are dedicated to sharing the beautiful culture of tea with the world. neighbourhood filled with traditional houses and shops. history and culture surrounding tea, before performing the tea ceremony itself. bowl of frothy Matcha under the guidance of your instructor. Address： Camellia FLOWER, 349-12 Masuya-cho, Higashiyama-ku, Kyoto-city. 2．Go north along Higashi-oji-dori street and turn right at the first intersection of Higashi-oji-dori street and Yakaka-dori street. 3．Go up the hill towards 'Yasaka-no-to" Pagoda. Turn right in front of the Pagoda and keep walking for another 100 m.
4．Go down the stone steps on your left which is called 'Ninenzaka.' Walk for 30 m and you will see a narrow alley on your left. 5．There is a sign saying "dead end" with a picture of geisha at the alley. Go through the alley and you will find the shop on your left at the end of the alley. Language：The experience is performed in English. All our staff speak fluent English. make your own bowl of Matcha. ・If you require a chair, please do not hesitate to ask our staff. Attractive JAPAN so that we can let Camellia know. We will be happy to help you to arrange a surprise at special occasions such as birthday and wedding anniversary with your precious persons. Why don't you make the day even more special, in a different way than usual? Please feel free to consult Attractive JAPAN. ・Adult: Age 18 and over. ・Child: Age 7 to 12.
content, so we do not serve tea to children under the age of 6.
concerns please let us know. Ninenzaka. This area is one of the most famous in Kyoto, so is well known by all taxi firms. The taxi will stop only 1 or 2 minutes away from Camellia. to call us on 075-525-3238 and we can explain our location to the driver in Japanese. you see steep steps descending on your left. This is NINENZAKA. small sign at the entrance will indicate this is the right place. and you will see us on your left. come to a stone gate (Torii Gate – traditional shrine gate). Turn right before the gate. You are now on NINENZAKA. In about 30m you will see a Hello Kitty shop on your right. end of the alleyway and you will see us on the left. Kiyomizu-dera (清水寺) in Higashiyama (東山). any misfortune and prevent the predicted death. luckily we can offer a bubble of calm in the very heart of Higashiyama. *Right after the online settlement is made, a cancellation fee of 10% will be incurred in case of cancellation. *The cancellation fee includes handling charges.